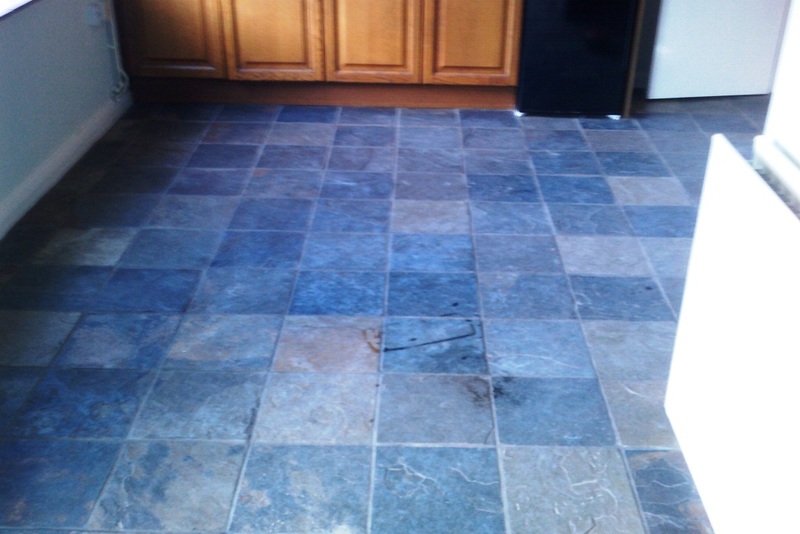 These slate tiles were installed in the back kitchen of a house in the seaside resort town of Bognor Regis, they were in good physical condition but unfortunately any sealer had worn off some time ago causing them to lose their appearance and look faded. Dirt had become ingrained into the tile so I went straight for a powerful cleaning combination of Tile Doctor Pro-Clean Tile and Grout cleaner mixed 50:50 with NanoTech UltraClean. The UltraClean adds tiny abrasive particles to the Pro-Clean making it a more effective cleaning product. The solution was left to dwell on the floor for a while before being scrubbed into the tiles with a rotary machine fitted with a black scrubbing pad; as usual a stiff hand brush was used along the grout lines to get them clean. The soiled solution was removed using a wet vacuum and floor thoroughly rinsed down with clean water. 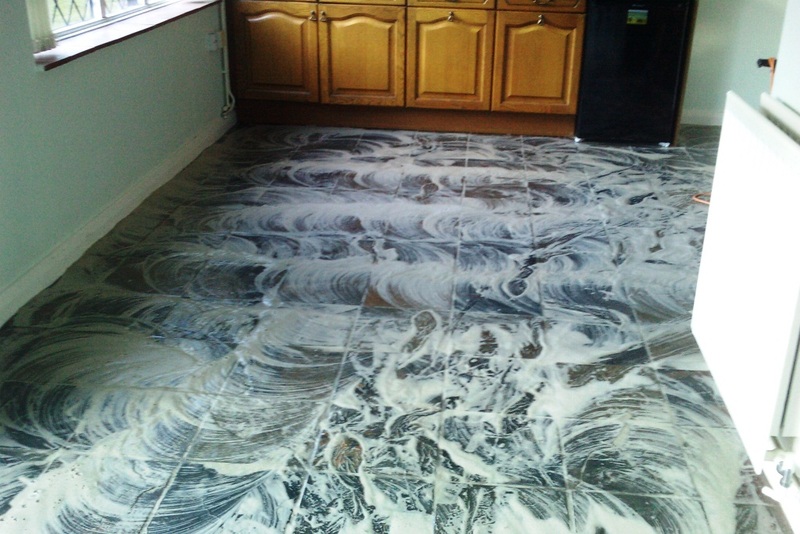 Pro-Clean works as a stripper as well as a cleaner and so any remaining sealer was also removed in the process. This process took a day so the floor was left to dry overnight and we came back the next day to seal it with five coats of Tile Doctor Seal and Go which is the ideal sealer for Slate tiles as it provides good stain protection with leaves a nice sheen finish; Seal and Go is also water based so there’s no smell like you get with other sealers. 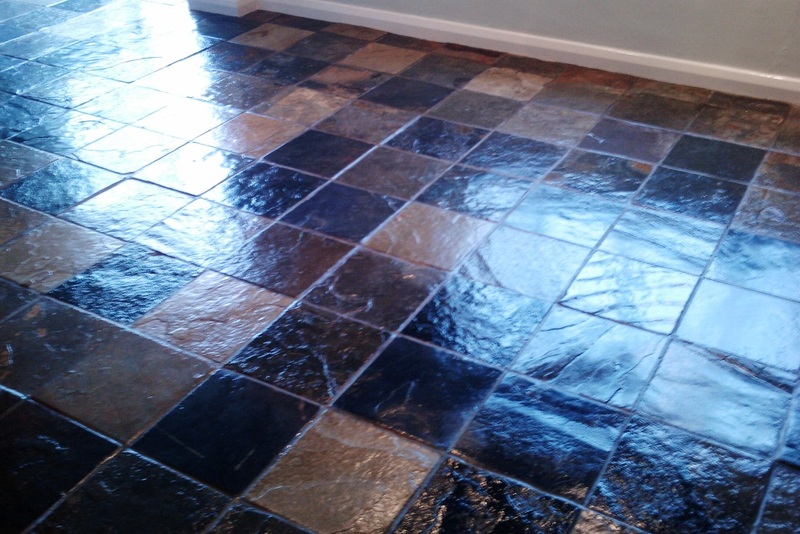 The slate tiles now look 100% improved and the sealer should keep them that way for two to three years depending on floor traffic.